Our cluster is responsible for scanning millions of e-mails a day and delivers a spam detection accuracy rate up to 99.98%. SuperWebHost.com applies the proprietary self-learning smart technologies developed by SpamExperts to eliminate spam, virus, malware and phishing emails before it reaches your network or inbox. We apply continuous improvements in secure data collection and analyses, instantly detecting new patterns and identifying details make it the perfect solution. An extra protective layer of incoming filter to your email flow and infrastructure adds redundancy and continuity to your email delivery process. When the destination mail server is unreachable, the Professional Spam Protection filtering systems queues inbound email and then delivers that mail when your email server is back online. 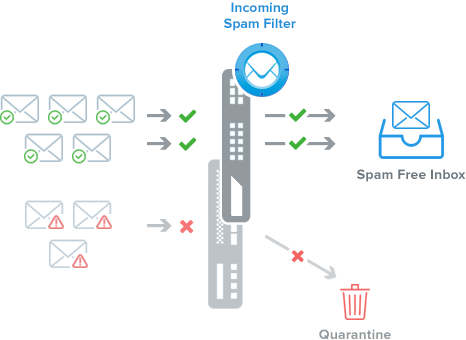 With our highly efficient first-level incoming filter defence running in front of your mail infrastructure, you will no longer need to deal with vast amounts of email spam. If you have any questions about how it works, please contact us. SpamExperts delivery queuing adds an extra redundancy level when the destination server cannot be reached. Adding the domain to the destination mailserver and the simple change in mx-records can be fully automated. That's all you need to do! per domain by paying Monthly Semi-Annually Annually Biennially on checkout. Bulk pricing cannot be adjusted (e.g. If you want to protect 27 domains you would need to order 2 x 10 domain packages, 1 x 5 domain package and 2 x 1 domain packages). How does the SuperWebHost Professional Spam Protection work? Our cluster becomes the server that handles your incoming e-mail. As we receive incoming e-mail destined for your inbox, our intelligent cluster scans it first. If there are no problems with the e-mail, it is immediately forwarded to your inbox. It's that simple! Do I need to modify my e-mail settings? Your e-mail details will remain exactly the same. The only thing you'll need to change are your MX Records – it's what mail servers check to see what server it needs to send your e-mail to. By default, your MX record will be set to the same server that hosts your website. Therefore, when you change the MX record to ours, your e-mails can be scanned before reaching you. How secure is your scanning cluster? Any e-mails which our system marks as spam will be moved into a spam quarantine - much like an anti-virus malware quarantine vault. We may also analyse e-mails which our system identifies as spam, thereby improving system accuracy and effectiveness. All of this is done on the anti-spam cluster located within a secure data center. Do I have to prepay for a year of spam protection? Not at all. All of our subscriptions are available on various payment cycles – simply choose the one that's right for you. As well as a 30 day money back guarantee, you have the flexibility to change or cancel your subscription at any time. You can always upgrade or downgrade your package as your requirements change. Can I use your Professional Spam Protection with another hosting provider? Sadly, we are not able to provide this service on hosting plans held with other providers. However, you may wish to move your hosting account over to one of our great hosting packages so you can take advantage of this service.